Your vehicle may be equipped with a sliding sunroof or a panorama roof with power tilt/ sliding panel. In the following section, the term "sliding sunroof" refers to both types of sliding sunroof. When opening or closing the sliding sunroof, make sure that there is no danger of anyone being harmed by the opening/closing procedure. The sliding sunroof is equipped with automatic operation and the anti-entrapment feature. If the movement of the sliding sunroof is blocked during the closing procedure, the sliding sunroof will stop and open slightly. The sliding sunroof operates differently when the sliding sunroof switch is pressed and held. See the "Problems with the sliding sunroof" section for more details. The opening/closing procedure of the sliding sunroof can be immediately halted by releasing the sliding sunroof switch or, if the sliding sunroof switch was moved past the resistance point and released, by moving the sliding sunroof switch in any direction. The sliding sunroof is made out of glass. In the event of an accident, the glass may shatter. This may result in an opening in the roof. In a vehicle rollover, occupants not wearing their seat belts or not wearing them properly may be thrown out of the opening. Such an opening also presents a potential for injury for occupants wearing their seat belts properly, as entire body parts or portions of them may protrude from the passenger compartment. if it is free of snow and ice. Otherwise, malfunctions may occur. abruptly. It could start to rain or snow. Make sure that the sliding sunroof is closed when you leave the vehicle. The vehicle electronics can be damaged if water enters the vehicle interior. addition to the usual airflow noises when the sliding sunroof is open. They are caused by minor pressure fluctuations in the vehicle interior. sliding sunroof after switching off the engine or removing the SmartKey from the ignition lock. This function is available for up to five minutes or until the driver's or frontpassenger door is opened. - Turn the SmartKey to position 1 or 2 in the ignition lock. switch in the corresponding direction. switch beyond the point of resistance, an automatic opening/closing process is started in the corresponding direction. You can stop automatic operation by operating the switch again. The sun protection cover automatically opens along with the sliding sunroof. You can open or close the sun protection cover manually when the sliding sunroof is raised or closed. Reset the sliding sunroof if it does not move smoothly. - Raise the sliding sunroof fully at the rear. switch pressed for another second. - Make sure that the sliding sunroof can be fully opened and closed again. - If this is not the case, repeat the steps above again. cannot be opened or closed fully after resetting, contact a qualified specialist workshop. The panorama roof with power tilt/sliding panel can only be operated when the roller sunblind is open. When raising the roof, automatic operation is only available if the sliding sunroof is in the closed position. When extending the roller sunblinds, make sure no one is in danger of being injured by the extending procedure. The extending of the roller sunblinds can be immediately halted by releasing the switch. switch repeatedly to the point of resistance in the direction of arrow 3 until the panorama roof with power tilt/sliding panel is fully closed. pulled for an additional second. switch repeatedly to the point of resistance in the direction of arrow 3 until the roller sunblinds are fully closed. - Make sure that the panorama roof with power tilt/sliding panel and the roller sunblinds can be fully opened again. power tilt/sliding panel and the roller sunblind cannot be fully opened or closed after resetting, contact a qualified specialist workshop. Your vehicle may be equipped with a sliding sunroof or a panorama roof with power tilt/sliding panel. In the following section, the term "sliding sunroof" refers to both types of sliding sunroof. Problem: the sunroof cannot be closed and you cannot see the cause. You could be severely or even fatally injured when closing the sliding sunroof with increased closing force or if the antientrapment feature is deactivated. Make sure that nobody can become trapped when closing the sliding sunroof. 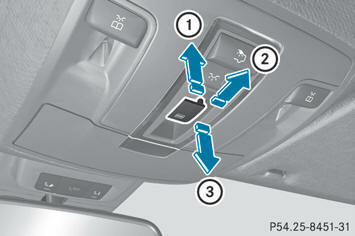 switch in the overhead control panel down to the point of resistance and hold it until the sliding sunroof is closed. The sliding sunroof is closed with increased force. The sliding sunroof is closed without the anti-entrapment feature. Pressing and holding the sliding sunroof switch to close the sliding sunroof immediately after it had been blocked two times will cause the sliding sunroof to close without the anti-entrapment feature for as long as you hold the switch. cannot be opened or closed as a result of a malfunction, contact a qualified specialist workshop.